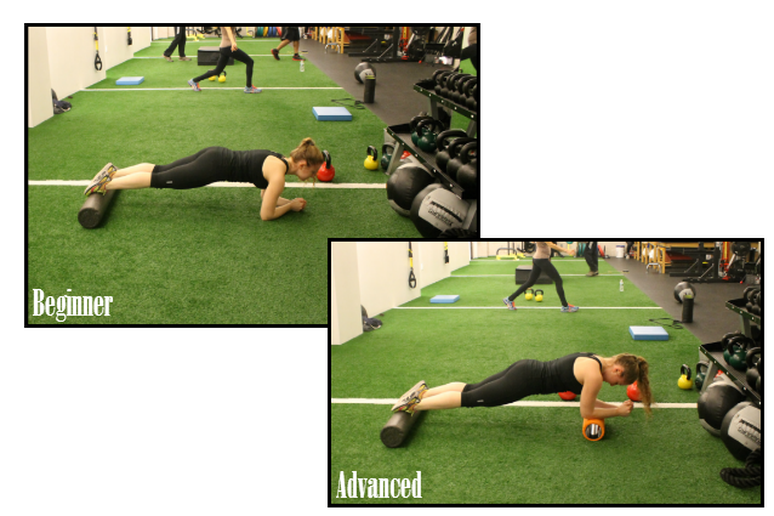 Here the foam roller serves the same purpose by creating an unsteady surface that adds increased challenge to the traditional push-up. Place one foam roller on either side of your body, about shoulder width distance apart. 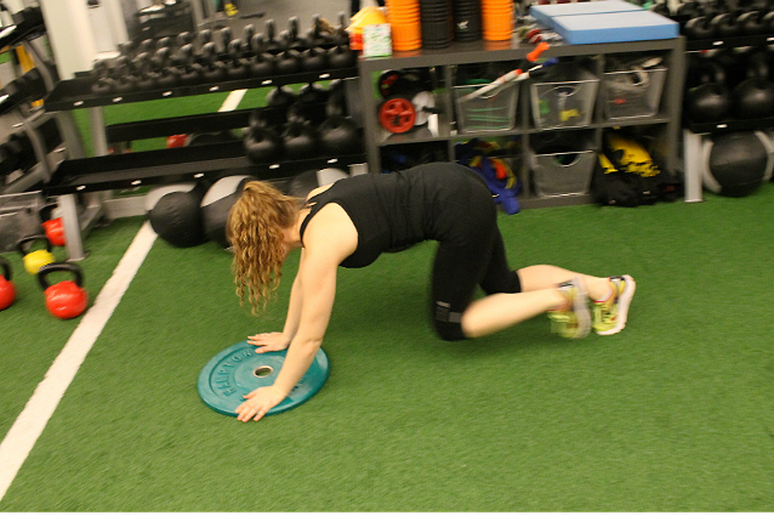 On all fours place one hand on each roller and slowly assume high plank position. Keeping your entire body in a straight line, slowly lower yourself down towards the floor. Return to the starting position. Repeat for 10-15 reps.
You’ve made the transition from the most common of crunches on the floor up onto the stability ball where you can achieve a greater range of motion, but short of doing 200 reps, how do you add more of a challenge from there? 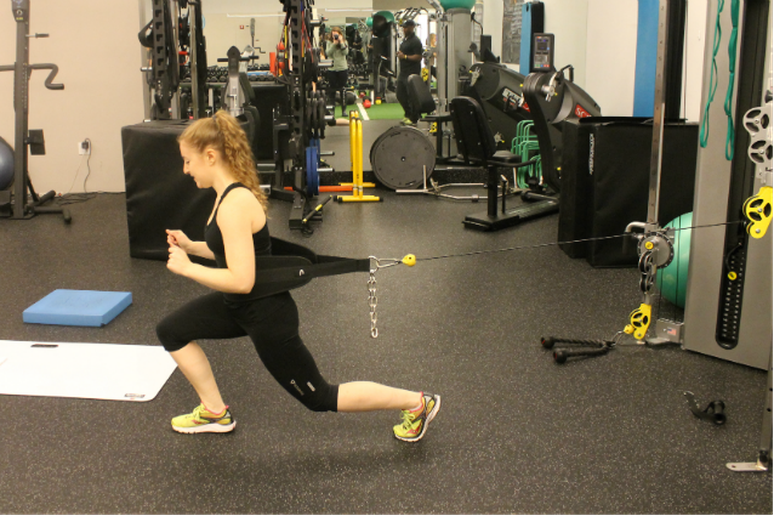 Simple: set yourself up in front of the cable trainer with the rope attachment. Sit on the edge of the ball and lean all the way back until you can grab each end of the rope in either hand (it helps to have someone hand them to you). Keeping your elbows bent and your hands next to your ears use your abdominal muscles to sit up straight. Slowly return to the starting position. Repeat for 10-15 reps. Seated row machine is taken? No problem. All you need to mimic this exercise is any type of non-resistant band (think TRX or yoga strap), a sturdy fixture to hang it from, and your own body weight. Stand back from the fixture and grab the ends of the strap with each hand leaning back until no slack remains. Position your feet slightly in front of you so that your body forms an angle with the floor (the further you place your feet in front of you, the more challenging the exercise will be). Making sure to keep your elbows close to your side, squeeze your shoulder blades and keep your core tight as you pull yourself up. Once you’ve reached the top, slowly release yourself to the starting position. Repeat for 10-15 reps. Similar to the standing row exercise, this is a great way to make use of a simple piece of equipment while also challenging your balance and stability. Place one end of the strap in each hand and stand back from the fixture so that the strap is almost fully extended. Sitting back into your heel, squat down on one leg while extending the other forward. Using the strap only for balance, stand back up by pushing through the heel of the foot of your bent leg. Repeat for 10-15 reps on each leg. 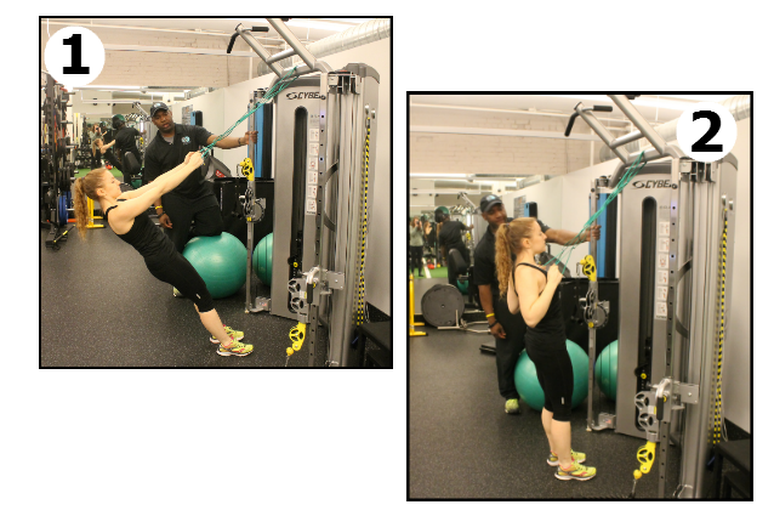 Most gym members are accustomed to performing this exercise with a rope or bar. Not only are those pieces of equipment not always available, but using a towel can actually make the movement more efficient. Gary says that the towel can help you recruit more of the triceps muscle because unlike the rope or bar, there’s nothing at the end of the grip that can be used to gain extra momentum. 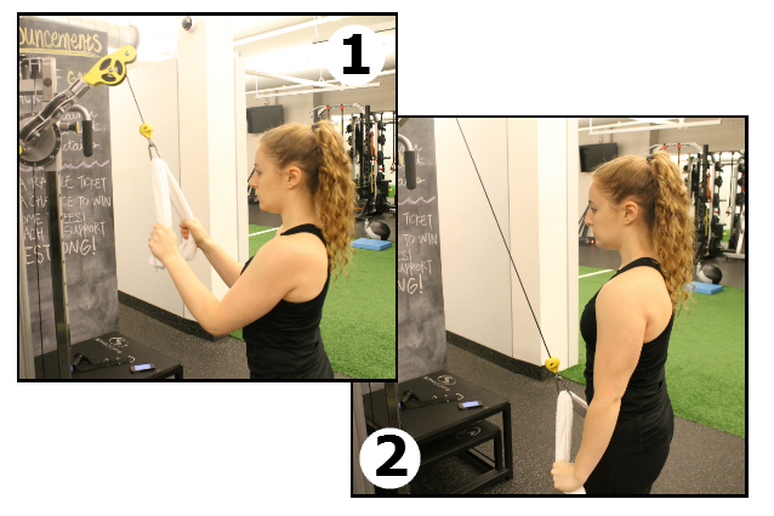 Before performing a set of traditional triceps pulldown for 8-15 reps, loop a small gym towel through the cable clip instead of a bar or rope. You can do a deadlift with a dumbbell, a weight plate, or a kettle bell; basically anything you can lift up and set back down. But did you know that you could deadlift using the cable trainer too? Set the arm low to the ground and clip in the rope attachment. Facing away from the trainer with your feet shoulder width distance apart, keep your back straight, your chest out, and your head up as you bend down to grab each end of the rope between your legs. Keep your arms straight as you use your glute, hamstring, and core muscles to raise your torso until you’re standing completely upright. Slowly return to the starting position. Repeat for 10-15 reps. Almost everyone knows how to do a lunge, and almost everyone knows it’s an exercise that burns with a capital B; so why not find a way to make it even more difficult, right? “Adding resistance in a different plane is good for injury prevention because it’s another influence that the body has to adjust to,” says Gary “It teaches the body to better handle multiple influences and every body part works better together.” Simply place an abdominal strap around your waist and clip it to the cable trainer. Take a few steps away in order to float the weight. Once you feel steady perform a set of 8-15 lunges with one leg, then repeat another set leading with the opposite leg. Gary likes core exercises that are more static in nature because they involve less twisting and exert less torque on your spine. The plank is a perfect example of an isometric ab exercise, and adding an element of instability like the foam roller will fire up your six pack even faster. Beginners can start by placing one roller underneath their feet. For even more of a challenge, use two: one under your feet and one under your elbows. Hold until failure. Rest, then repeat 2-3 more times. News flash: you don’t need an actual bench to bench press. If this is the next exercise on your list and there’s not an empty bench to be found in the gym, grab your dumbbells and a Bosu ball and get to work. 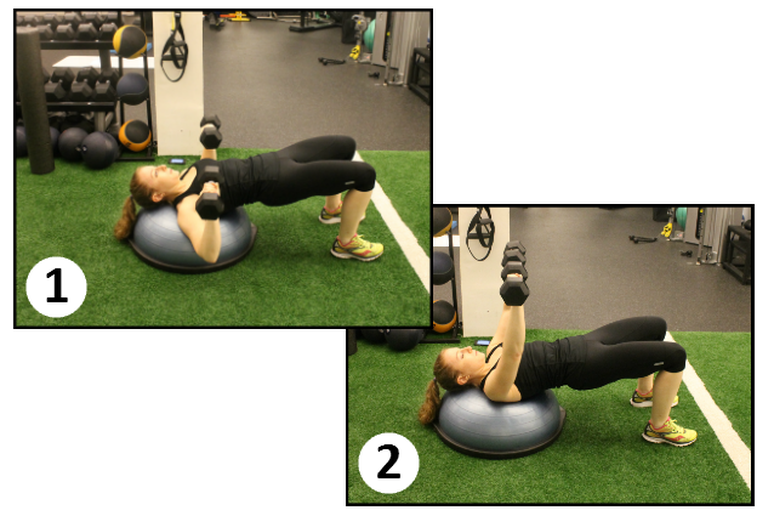 Rest your upper back on the Bosu. (If you’re using light weights you can begin with them in your hands. If you’re lifting more than 12 pounds it’s best to have someone hand you your weights after you’re set up on the Bosu ball.) For even more of a challenge, raise your hips off the ground and engage your core to keep steady. With your palms facing forwards and your elbows at a 90 degree angle, press the weights straight away from your chest until your arms are completely outstretched. Return to the starting position. Repeat for 8-15 reps. There are a handful of ways this cardio-conditioning exercise can be performed. Try a weight covered by a towel over a wooden floor, a rubber plate over turf, or even an upside down gym box on a yoga mat. Use your imagination. All you need is something heavy that you can slide over a distance of about 15-20 yards. The more space you have, the better. Assume a low track start position and place both your hands on the “sliding” object. Making sure to keep your hips low and your core tight, use your hands and feet to push forward until you reach the end of your space. Turn around and repeat until you reach the starting point. Rest, then repeat 2-3 more times.